So having decided not to fill blog posts up with boring days in Kathmandu, I have now skipped through to Sunday 6th November. 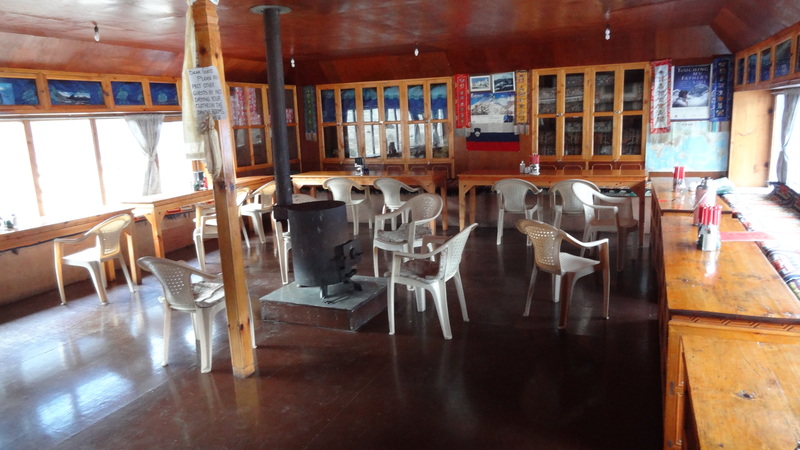 Since I last wrote, which was Friday, my third day in Lukla, I spent all of Saturday and all of Sunday doing pretty much exactly what I had done on the three days before. Mornings were waiting for helicopters which never came, afternoons in Fakebucks getting a bit of wifi and catching up with the outside world (if very very very slowly, the connection was slower than any old dial-up I ever remember. 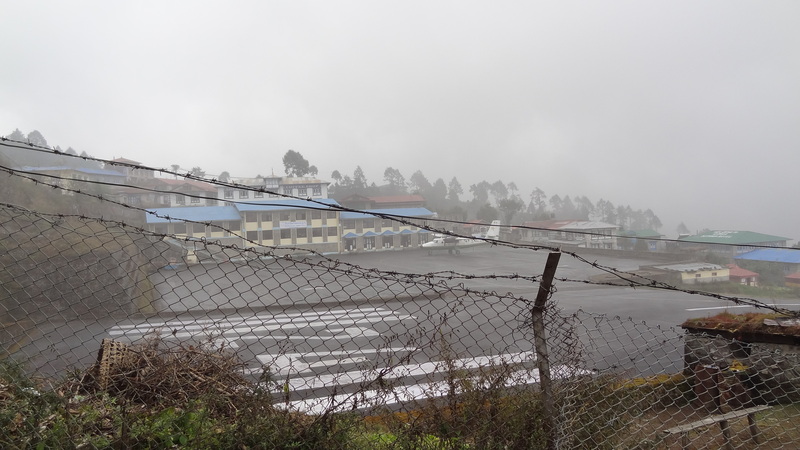 The weather however has been exactly the same, and it has rained with low cloud both days, which means that no aeroplanes whatsoever have landed here now for six days now. The odd break in the clouds offers a bit of a glimpse of the runway. This plane (the only one here) has been here since last Tuesday and not moved. Then a few beers in the ‘Irish Pub’, and then back to base for the evening of sitting and listening to everyone else’s tales of how near and yet so far the helicopter that never came really was. A good thing happened mid afternoon today (Sunday) however, in that the rest of the Island Peak Group made it down the mountain. 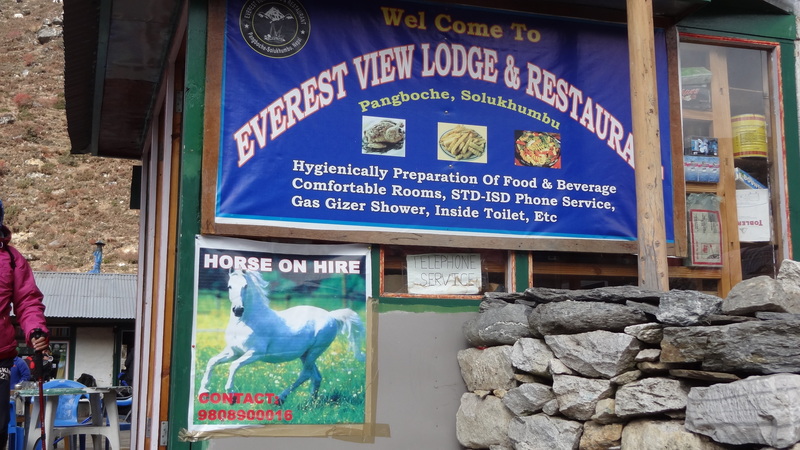 I had already heard their summit news from Val, the excellent Exodus guide who had made it down to Lukla a day before them. So basically, my huge congratulations to each of Tony, Rob and Dave, who all successfully submitted Island Peak, all 6,189m of her, on 3rd November at about 7am. I am really looking forward to seeing their photographs from the top. Of the others, Stefan had tried but had to turn back, and each of Bruce and Ben had decided that it would be too much, and did not set out. 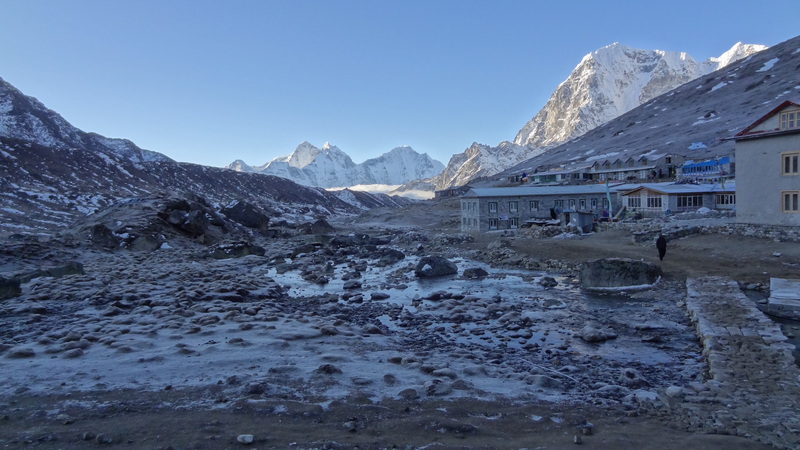 They all made it to high camp though at 5,600m, and the photos look stunning from there even. As I look back now and reflect, there was no way I would have made it to the top, not feeling the way that I did, and so I did the right thing with hindsight in coming down early. 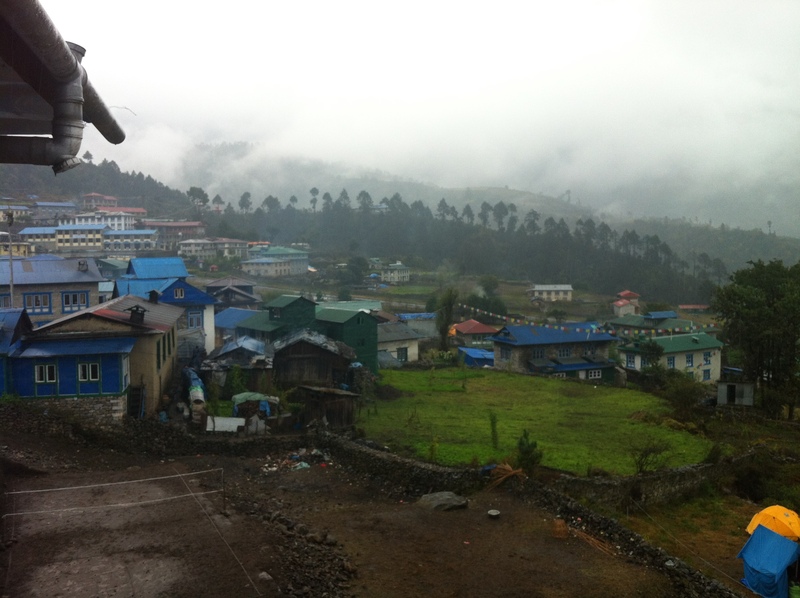 I feel much better for some days rest, despite the tedium of not getting out of Lukla. The mountain will still be there should I decide upon some later occasion to try again, so there is nothing lost for me. 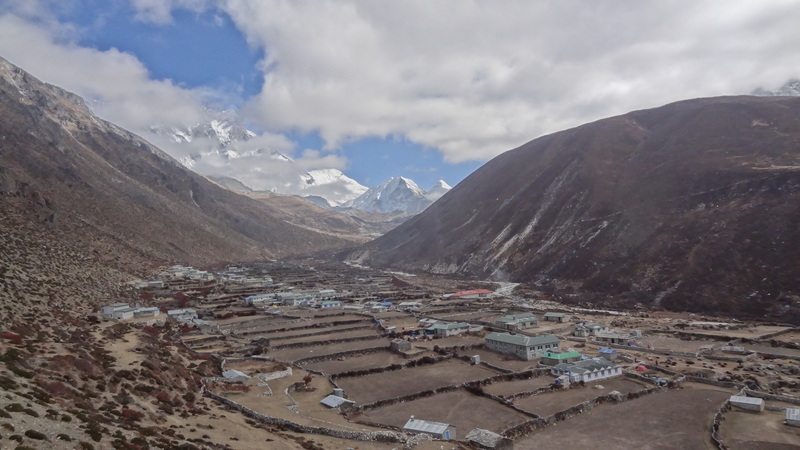 So anyway, each of them, having picked Mo up where I had left her in Tengboche five days ago, made it down the mountain, somewhat wet due to the rain, and settled in to the North Face Resort for the night. 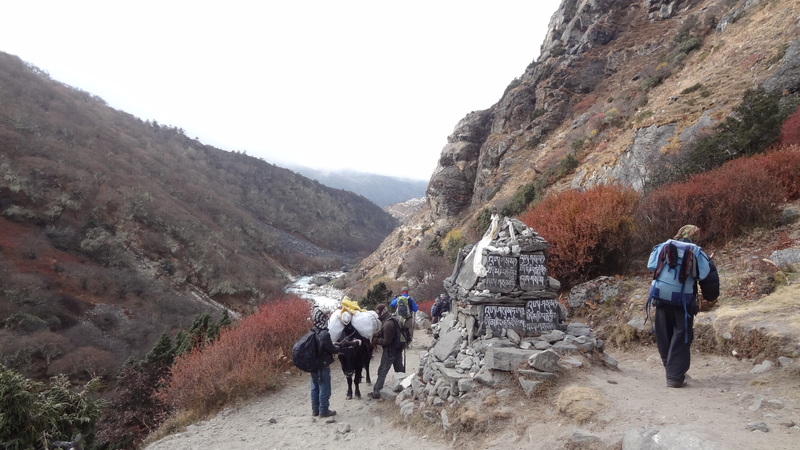 They had already heard that Lukla was a.) full, and b.) closed to air traffic, so there were no surprises in store for them really when they got there. They unfortunately had to stay in tents too, which made me feel a little guilty as I still had my room, although my room was by now so damp that I wondered if a tent would actually be a much dryer place. 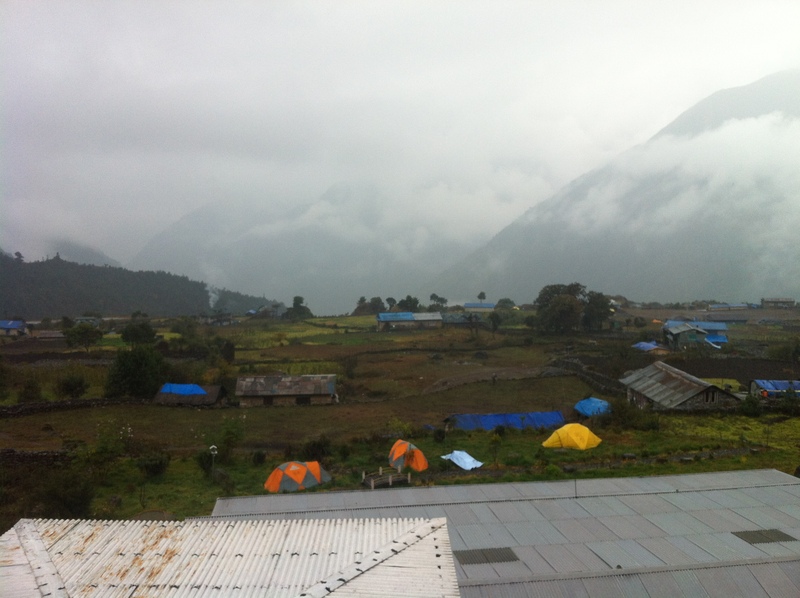 The view down the mountain from Lukla, the tents in the foreground the sleeping quarters for the Island Peak returnees. We celebrated everyone’s ‘coming down the moutnain’ in the Irish Pub, and then back at the Lodge in the evening we did the tipping ceremony. 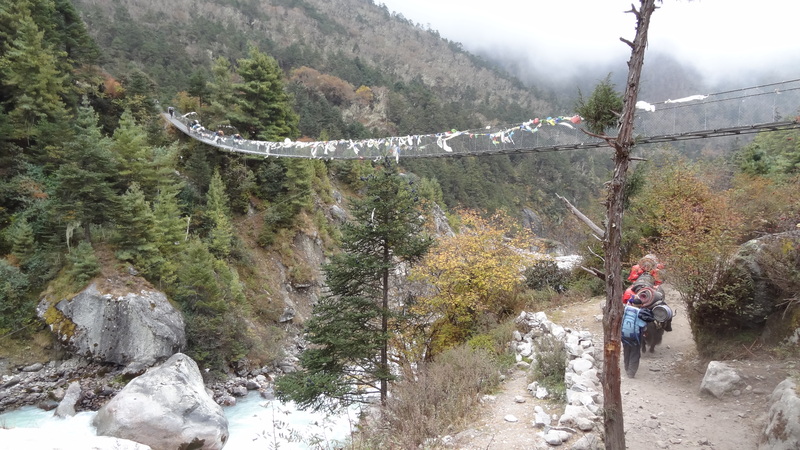 It is customary on these trips to pay your porters and guides to thank them for their support whilst out on the mountain. Each of us put in approximately US$100, and so they all seemed pretty happy with their share of the spoils, presented to them with appropriate aplomb by Bruce. We also bought them two bottles of the local rum, Kukira, which they duly despatched between them inside about an hour. Bruce and I had some of this noxious fluid also in a hot chocolate, and that was sufficient to give me rather a thumping head in the morning – I thought it was AMS all over again for an instant!